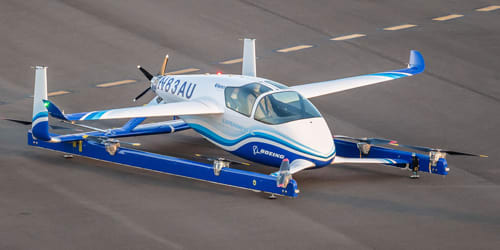 Boeing successfully completed the first flight of its Aurora autonomous passenger air vehicle (PAV)—which could one day soon transport urban passengers around the city. “In one year, we have progressed from a conceptual design to a flying prototype,” said Boeing Chief Technology Officer Greg Hyslop. This first flight tested the vehicle’s autonomous functions and ground control systems. The prototype completed a controlled vertical takeoff, hovered briefly, and landed. Future flights will test the Aurora’s airborne flight capabilities. They will also test how the PAV transitions between vertical and forward flight modes—which is often the trickiest challenge for vertical takeoff and landing (VTOL) aircraft. The PAV—which looks like a plane cockpit strapped to a pair of skis that are each equipped with four drone motors—has a design range of up to 50 miles and is designed for fully autonomous flight from takeoff to touchdown. The airframe integrates the electric propulsion system with the wings to maximize hover and forward flight efficiency. Boeing intends for the vehicle to function as an air taxi—part of a quieter, safer and greener generation of autonomous aircraft that meets urban transportation needs. The plane maker’s Boeing NeXt division leads the company’s urban air mobility portfolio. The division tapped Boeing subsidiary Aurora Flight Sciences—which Boeing acquired in 2017—to design, build and test the vehicle. The PAV is only part of Boeing NeXt’s plans for autonomous electric flight: the division is also working on an unmanned electric cargo air vehicle that completed its first indoor flight in 2018 and is scheduled for outdoor flight testing this year. The Aurora VTOL’s first flight. Boeing NeXt not only works on the technology—the division also collaborates with regulatory bodies and industry partners to create an environment where autonomous vehicles can share the skies with piloted aircraft—and a market for Boeing products like the PAV. The aerospace giant clearly has a long-term strategy for the autonomous aircraft sector—and it intends to play a big role in it. Read more about Boeing`s strategies for continued success at Boeing Outlines Vision for Future of Aerospace.